Are you looking for the perfect October pen? 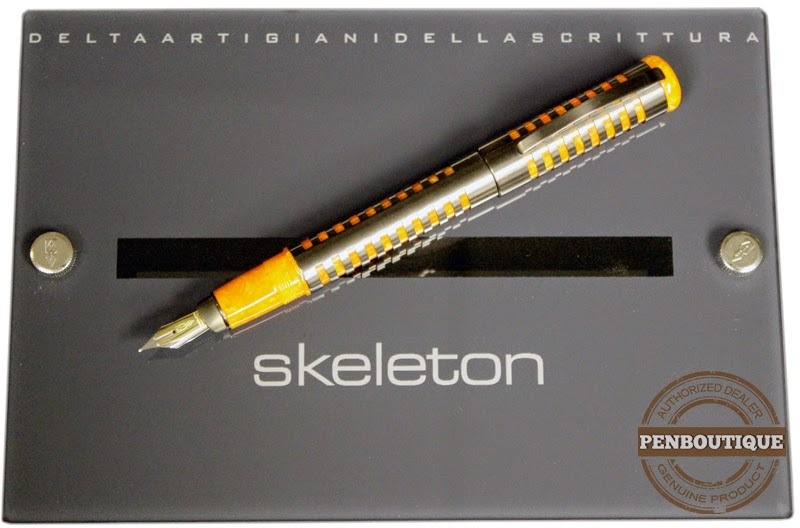 Take a good look at the Delta Dolcevita Skeleton Limited Edition fountain pen. The gorgeous orange resin marbling with the black rhodium coated metal cage-style overlay looks like something from Dr. Frankenstein. There is a clear demonstrator version with the black metal rhodium coating, which is nice to see the ink and piston filler, but I prefer the classic orange and black for looks. The metal overlay does not interfere with comfort when writing. The stainless steel nib is fused with 18K gold making for a striking nib design. It is very smooth and doesn't grab the paper when writing. The cap is a screw on, both to open/close the pen and to post. The size of 5 9/16" x 5/8" makes it pleasant to hold and to fit in most pen cases with ease. It is a heavier pen at 1.8 ounces. The rear top piece unscrews to allow access to the piston filler knob. It is limited to only 888 pieces and the serial number is on the rear of the cap. Pair this pen with Diamine Autumn Oak ink and you have a great pen to write your October notes and Halloween greetings with. This pen is definitely a treat, not a trick.